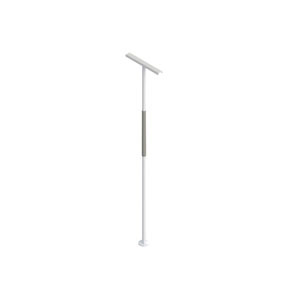 SuperPole™ is a safety pole that can be easily installed between any floor and ceiling by simply turning a jackscrew. The pressure created by the jackscrew is strong enough to support you, yet it does not require drilling holes into the floor or ceiling. This is ideal for relocating or removing the pole. Also, it features a grip that provides comfort and an improved surface to grab onto. All this functionality is contained in a clean, modern design that blends into any room.